1Does a true civil society exist in Yemen? 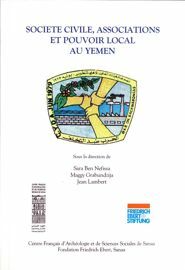 To answer this question the author examines if the structure and function of traditional communities in Yemen match with the common criteria used to define modern civil society, such as the definition of Alexis Tocqueville who emphasizes voluntary aspects and autonomy of action. According to these definitions, a proper civil society is independent of political power; defends community members, the justice system and the principle of citizenship, contributes to the establishment of institutions, is devoted to the values of democracy, is based on voluntary action and is characterized by regular transfer of power. The author considers that Yemeni civil societies do not fulfill these conditions. 2The main obstacle to the development of civil society is the rural organization of society which persists in spite of the progress achieved in the modernization of the political, industrial, agricultural, cultural, social and democratic system as well as in the enhancement of exchanges between urban and rural areas. Those rural structures favor the persistence of “mechanical solidarities” opposed to “organic solidarities” more favorable to the construction of civil society. 3In spite of their modern appearance, existing organizations are still, to a large extent, attached to behavior patterns that originate from the traditional society in which interpersonal relations play a major role. They have not yet passed on to a culture of disinterested effort, a difficult step to take in a phase of unfavorable economic conditions. Civil society organizations therefore still struggle to achieve their social goals. For these reasons the author comes to the conclusion that in spite of a development towards the construction of a civil society, we cannot yet talk about the existence of a proper civil society in the case of Yemen. AL‑SHAMIRI, Samir. Civil Society and Traditional Communities (abstract) In : Société civile, associations et pouvoir local au Yémen : Actes de la Table Ronde « Société civile, citoyenneté et pouvoir local », Sanaa, 1–3 juillet 2006 [en ligne]. Sanaa : Centre français d’archéologie et de sciences sociales, 2008 (généré le 21 avril 2019). Disponible sur Internet : <http://books.openedition.org/cefas/1406>. ISBN : 9782909194578. DOI : 10.4000/books.cefas.1406. al‑Shamiri, Samir. “Civil Society and Traditional Communities (abstract) ”. Ben Nefissa, Sarah, et al.. Société civile, associations et pouvoir local au Yémen : Actes de la Table Ronde « Société civile, citoyenneté et pouvoir local », Sanaa, 1–3 juillet 2006. Sanaa : Centre français d’archéologie et de sciences sociales, 2008. (p. 265) Web. <http://books.openedition.org/cefas/1406>. BEN NEFISSA, Sarah (dir.) ; GRABUNDZIJA, Maggy (dir.) ; et LAMBERT, Jean (dir.). Société civile, associations et pouvoir local au Yémen : Actes de la Table Ronde « Société civile, citoyenneté et pouvoir local », Sanaa, 1–3 juillet 2006. Nouvelle édition [en ligne]. Sanaa : Centre français d’archéologie et de sciences sociales, 2008 (généré le 21 avril 2019). Disponible sur Internet : <http://books.openedition.org/cefas/1242>. ISBN : 9782909194578. DOI : 10.4000/books.cefas.1242. Ben Nefissa, Sarah, et al., ed. Société civile, associations et pouvoir local au Yémen : Actes de la Table Ronde « Société civile, citoyenneté et pouvoir local », Sanaa, 1–3 juillet 2006. Sanaa : Centre français d’archéologie et de sciences sociales, 2008. Web. <http://books.openedition.org/cefas/1242>.